The weeks leading up to Prom are stressful enough for any high school student. Even more so for Victor who plans to use the event as a platform to show the world who he really is. You see, Victor intends to embrace the inherent divinity of a young man in feathers and heels. 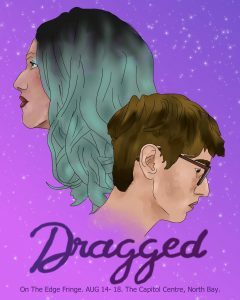 “Dragged” is an exploration of gender nonconformity in the delicate, pubescent years. It’s an important conversation of what it means to be true to yourself. “Dragged” was collaboratively created and developed over a six week intensive training, writing and rehearsal period by the participants in the eight week Fringe Summer Student Program, funded through Canada Summer Jobs. Joshua Bainbridge served as instructor and mentor in all aspects of creation and staging, working with the students and Matt Lishman to further their abilities and help them to realize their shared vision.